I've found books, fairy posters, calendars, collectibles, t-shirts and comforters for you. From Goddesses, to Lord of the Rings, from Terry Pratchet's Disc World to Star Wars. My favorite fantasy authors, movie themes and artists. I just love fantasy fiction. I do. I love Harry Potter as well as The Lord of the Rings (which my dad told us on our sunday walk). I love the mysterious art inspired by fantasy creatures... In short: I love everything about fantasy fiction. Here are my pages about the subject. LOTS of Harry Potter, but also my other favorite fantasy authors. Dress up your room with Harry Potter pillows, plush toys, and banners. 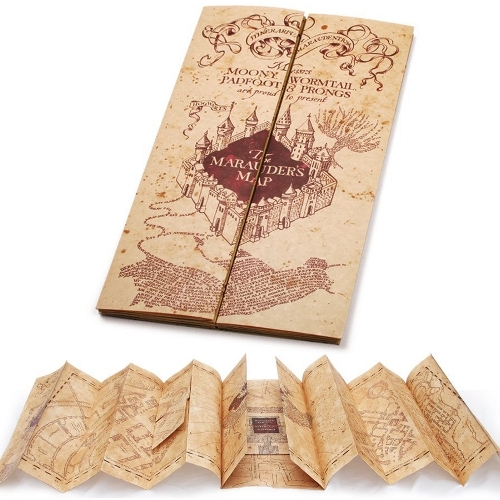 From the Marauder's map to the Snitch, from Hogwarts to Harry and his friends. Slytherin gift ideas - Slytherin is the house in Hogwarts where all the bad guys go. Perhaps you feel like a villain yourself and want to show off belonging to Snape's house? Ravenclaw gift ideas - Smart and sassy, perhaps that describes Ravenclaw house best. For the brainy Harry Potter fan. Luna Lovegood goes to Ravenclaw. Hufflepuff gift ideas - The most boring house in Hogwarts. However, Cedric Diggory (who was killed by Lord Voldemort) went to this house. A reader says: Proud Hufflepuff over here! I would much appreciate it if everyone would stop dissing my house. Sure, pick on the nice ones! We're not boring, we just know what we want and do what we can to get it. Need I remind everyone we had Nymphadora Tonks as well? Stop house discrimination! One of the science fiction greats. Where does fantasy end and religion begin? I sure don't know. In popular culture the two certainly overlap quite a lot. Whether these Goddess paintings strike you as fantasy or religious reality, they are sure beautiful and inspiring images of female power. An artist whose art is still popular in the pagan scene, Susan Seddon Boulet will mostly be remembered for her goddess art. The mystical style of her paintings (mostly, but not exclusively, water color) strikes a core in many. The star wars series of movies doesn't really fit the label 'fantasy' - it's more science fiction. However, I do like Yoda and I think as a not-quite-human-with-special-powers, he may be considered 'fantasy'. Featuring elves, trolls, orks, walking trees as well as dragons and intelligent eagles, Lord of the Rings and The Hobbit are perhaps the ultimate fantasy world. My father read them both to us as we were growing up - both the books themselves and his summary of them on Sunday walks. So of course we had to see the movies as a family project when they came out. Fortunately the Lord of the Rings movies lived up to our expectations, because getting our dad to a movie theater was a bit of a challenge in the first place. When I saw the first 'Hobbit' movie however, I was disappointed. The second was better, in my opinion. In the world of fantasy art, Ciruelo Cabral's artwork is renowned. Known simply as Ciruelo, he is an accomplished painter with an international following. His artistic skills have brought the art of the dragon back into the limelight. 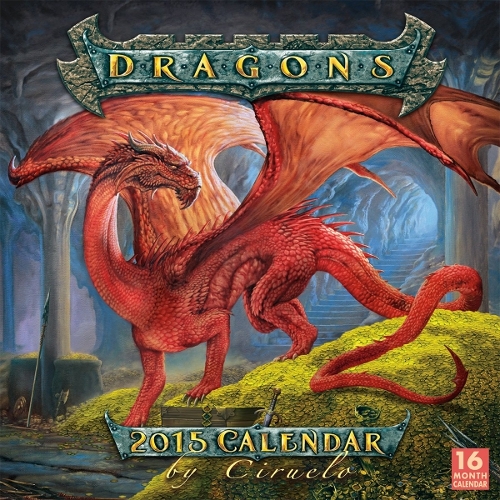 The dragons depicted here will fascinate fantasy enthusiasts for the entire year. Susan Seddon Boulet Fantasy Calendars and Date Books - Her fantasy art uses the symbols she found all over the world. Susan Seddon Boulet (1941-1997) was a passionate student of the world religions and mythology.